5 Unbeatable Uses For Evernote In the Science Classroom | Gary G. Abud, Jr.
With more and more students bringing devices into classrooms across all grade levels, and with many schools going 1:1, a need to move toward digital notes is ever increasing. While teachers who use interactive whiteboards or tablets in the classroom have the ability to create a digital copy of their notes in PDF format to post online, these notes are static and one-directional. To really harness the power of digital note-taking, a better approach is necessary. Moving away from traditional digital notes that are merely pictures (PDFs) of notes is a great start, but that involves selecting a better classroom device than an interactive whiteboard, such as an iPad. The iPad has two free apps that will springboard any teacher into dynamic digital notes that can be easily shared with students. While I’ve written about the power of using Penultimate and Evernote together before, I can’t say enough about how essential Evernote is as a classroom tool for teachers. Since discovering it a couple of years back, I have found several ways to integrate Evernote into my classroom workflow and professional routines. Over time, I introduced students to Evernote, and what resulted amazed me. In the science classroom, there are many uses for the teacher and students to use Evernote. Many of these ideas won’t look all that ground-breaking, because they are classic strategies that are enhanced by using Evernote. The best way I have found to incorporate a new tech tool or app into my workflow is to enhance my current practice whenever possible. Since Evernote works across all computer and mobile platforms, in addition to having its own web app, it is an easily accessible free tool to use no matter what technology you have available. Then, consider all of their companion apps, like Skitch and Penultimate, that integrate perfectly with your Evernote account to give you expansive capability, and you’ve got a suite of powerful apps at your disposal. Whether you are in a computer lab, a BYOD classroom, or a 1:1 tablet environment, your science classroom can get a lot of mileage out of Evernote. Let’s look at some uses for Evernote in the science classroom that you can get started with right away this fall. Students and teachers using Evernote can create individual notes, entire notebooks, or sets of notebooks (called stacks) that contain text, audio, photo, URL, or attachments in your notes. You can tag your notes, creating categories, or geotag your notes for search by location. The search functionality of Evernote lets you quickly find a note containing a certain word or phrase. If you integrate a hand-writing app, such as Penultimate, into your Evernote toolbox, it can even search your handwriting. These notes are editable and shareable. This means that notes can be modified later or updated at any time. With the variety of content possible, your notes become dynamic. In a single note, students could take a photo of their experimental setup and then audio narrate their materials list and explain the apparatus being used in the lab. Many science classes require students to keep a dedicated notebook for lab experiments and scientific investigations. I know I always have. I used to buy each student a graph-ruled composition notebook in which to keep all their work related to experiments. These notebooks worked great in the lab, because students could keep organized, draw graphs, and keep all their lab findings in one place. However, one thing happened that made them less efficient than I would have hoped. When we would use software-based lab probes to take data and generate graphs, students had to copy the graphs off the computer screen into their lab notebook, or print out, cut and paste (not CTRL+V either!) their probe data tables and graphs into their notebooks. Now, with Evernote, students can have a dedicated Evernote notebook for the science lab experiments and a separate one for the rest of class. In their Evernote lab notebook, they can create lists for their procedure, and insert a photo taken from their device of a computer-generated graph. Keeping track of all the experiments is easy, because of Evernote’s search functionality. No more frantically flipping through pages! In a single notebook, students can have a separate note for each lab experiment they do in science class. Each note can include pictures of the experimental observations, materials lists, audio recording of the discussion of results, and text written conclusions all in different colored rich text. Imagine what this could look like in digital form. Students create a notebook in Evernote, call it “Experiment 5: Photosynthesis” and share it with the teacher. Inside of the notebook is a separate note for each section of the lab report. Within those notes, there could be text, audio, or images included to enhance the richness of the report. This is a lab report from when my chemistry students created a soap manufacturing company and made soap. I can remember how I used to keep the stack of reports until they were graded, and then students get them back. If a student made any changes to fix errors, the exchange happened again. With Evernote and shared notebooks, the live editing is automatically synced and the notes stay in one digital place. Students can make their lab report into a unique notebook, creating a separate note within that notebook for each section of their lab report, and then they can share their notebook with the teacher for submission. Students and teachers can keep track of their own notebooks in Evernote using its visual organization, but it will also organize any shared notebooks or stacks within your account the same way. This gives the teacher the opportunity to see all the students’ shared (turned in) work in one place, or students to see their lab group members’ information all in the same place. If students share a notebook stack with their teacher at the beginning of the year, then they can add a separate notebook in that stack for each lab report, and each section of the lab report can be a separate note in that notebook. Then, everything gets automatically shared with the teacher for easy reviewing. There’s no need to share each subsequent lab report notebook. If the student needs to make changes, those edits will show up live in the shared notebook stack. Teachers can share their teacher notes with students, who can them view them alongside their own notes for easy comparison when studying. Teachers can include answer keys to assessments or assignments, class notes, or pertinent pre-lab information students might need to explore before their experiment. No more piles of lab reports to cart around. All student lab reports, or notebooks, can be viewed in one place and easily toggled between or searched. No more having to upload every class period’s teacher notes, because the automatic syncing of Evernote keeps all your notes up-to-date. 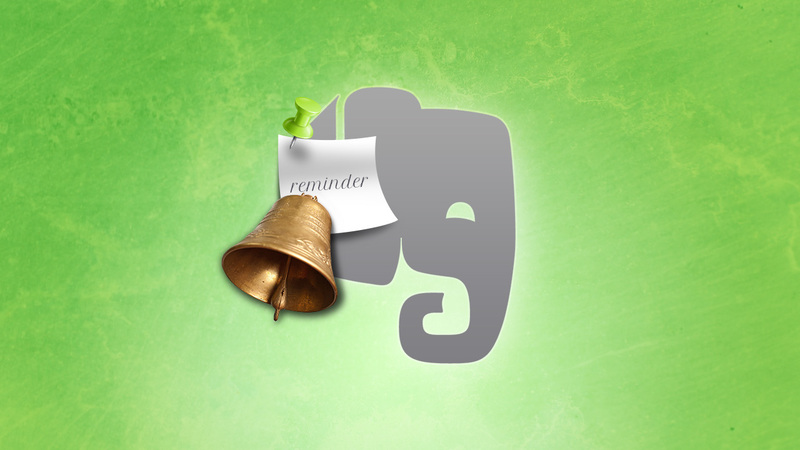 Evernote will remind the user in two ways: by email and by pop-up in the app itself. The reminder shows up as the title of the note that has that day as its due date. The email reminder you get shows up at the beginning of each day. It has a list of all notes that are due on that day. Create notes with file attachments, text directions, audio or images and add a calendar reminder. This is perfect for pre-lab reading, study guides for tests, or upcoming project directions. Gary … thanks for sharing in such depth how you are having your students use Evernote. You have some really great ideas. Two questions for you. One, did you set up some sort of standard naming convention for notes / notebooks students share with you? Second, I have forgotten, do you need the premium account to share notes & notebooks? Thanks Ed! First question, the naming convention is based on subject area-period, e.g., chemistry-5th hour, or physics-3rd hour. Second question, with the free account, you can share notes and notebooks with view-only permission. With premium accounts, you can share notes and notebooks with view as well as edit permission. The premium account will achieve a collaborative aspect of Evernote that isn’t really described here, because I used free accounts with my classes. Good luck and let me know how it goes! Hoping maybe we could use this in the Academic Center at RHS! Great post, thanks! Many of these uses can be adapted for any classroom or subject area. Let me know how it goes and if you have any questions this year. Thanks!